Global markets for equities and bonds moved higher in May providing good gains for diversified portfolios. This was true despite a continued rally in the Canadian dollar (CAD) versus the USD, which subtracted from most foreign currency denominated ETF returns in May. Global equity markets rebounded in May. US small-cap and tech stocks, as well as Japanese equities, which all sold off sharply in April, recovered some lost ground. US large cap, Canadian and European equities posted gains. Global bonds continued to rally in May, with Canada bonds outperforming foreign currency bonds in CAD terms. Emerging Market assets recovered further in May, as Ukraine held elections and Putin said he would negotiate with the new leadership. Gold and commodity ETFs posted losses in May. Energy prices firmed as the WTI crude oil futures price rose to $103/bbl at the end of May from $100/bbl at the end of April. Global growth forecasts for 2014 continued to be revised down, led by a downward revision to US real GDP, which now shows a contraction in Q1. Global inflation showed mixed signals, with inflation looking as if it firming in the US and Canada, but still weak in Europe and China. On the central bank front, the US Fed indicated that it plans to continue to taper its QE program despite negative Q1 growth. Fed Chair Janet Yellen maintains that policy rates will remain at the current low level as long as slack remains in the labor market. Members of the FOMC remain widely divided on how soon and how much the policy rate should be raised. The ECB appears to be edging closer to some new form of policy easing. The BoJ reaffirmed its intention to continue to implement its massive QE program. China’s PBoC appears to be considering its own form of Quantitative Easing even though it has ample room to lower its policy rate. The previous tailwind of a weaker Canadian dollar for Canadian investors in global ETF's continued to reverse in May. Bank of Canada Governor Poloz continues to signal increased confidence in a soft-landing for Canada’s inflated housing market and no interest in tightening monetary policy any time soon. The S&P500 closed May at a record 1924, up from 1884 at the end of April and 1842 at the end of December. Global equity ETFs posted decent returns in May. The C$ strengthened 1.0% vs. USD in May, lowering Canadian dollar returns on USD denominated ETFs. Japanese equities (EWJ) provided the strongest returns among the equity ETFs we track, gaining 3.4% in CAD terms. Emerging Market equities (EEM) returned 1.9%, US Large Cap (SPY) returned 1.2%, Canadian equities returned 1.1%, and Eurozone (FEZ) returned 0.3%. US small caps (IWM) posted a loss in May, returning -0.3% in CAD terms. 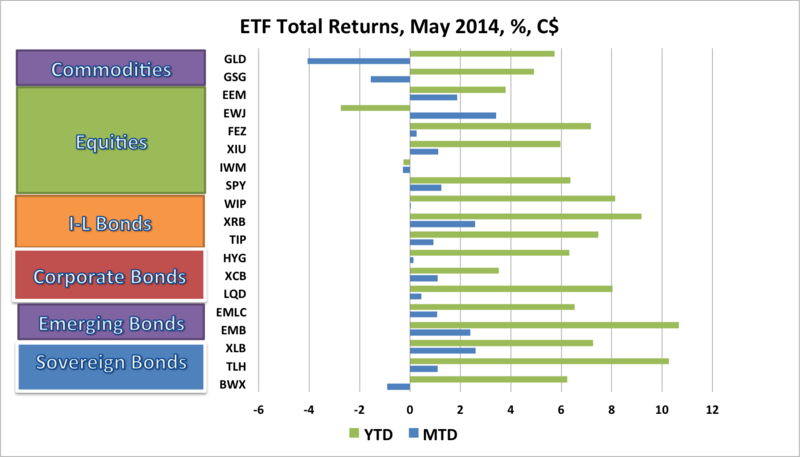 Commodity ETFs lost ground in May. The Gold ETF (GLD) returned -4.1% in CAD terms, while the GSCI commodity ETF (GSG) returned -1.6%. Most global bond ETFs turned in solid performances in May. ETFs with positive returns included Canadian Long Government bonds (XLB), which posted a 2.6% return, USD-denominated Emerging Market bonds (EMB) returned 2.4% in CAD terms, the US long government bond (TLH) 1.1%, and Emerging Market Local Currency bonds (EMLC), posted a 1.1% return in CAD terms. Non-US government bonds (BWX) underperformed, returning -0.9% in CAD terms, as peripheral European bonds weakened. North American inflation-linked bonds (ILBs) posted positive returns in May as inflation showed more signs of turning up. Canadian RRBs (XRB) returned +2.6%, while US TIPs (TIP) returned +0.9% in CAD terms. Non-US ILBs (WIP) returned +0.04%. Corporate bonds underperformed government bonds in May as US investment grade (LQD) and high yield (HYG) bonds returned 0.4% and 0.1% respectively. Canadian corporate bonds (XCB) returned +1.1%. In the first five months of 2014, with the Canadian dollar depreciating 2.0% against the US dollar, the best global ETF returns for Canadian investors were in Emerging Market bonds (EMB) and US long bonds (TLH). The worst returns were in Japanese equities (EWJ). In global equities, the Eurozone equity ETF (FEZ) performed best, returning +7.2% year-to-date (ytd) in CAD terms, initially on signs of improved growth and lately on indications that the ECB will ease monetary policy to combat persistently low inflation. The Canadian equity ETF (XIU) performed well, returning 6.0%. The S&P500 ETF (SPY) returned 6.4% in CAD terms. Emerging Market equities (EEM), suffering from Fed tapering, political turmoil, and China’s growth slowdown, returned 3.8% ytd in CAD terms. The Japanese equity ETF (EWJ), hit by Yen strength and slowing Asian growth, returned -2.8%. US small caps (IWM), after a sharp selloff in April, returned -0.3% ytd. Commodity ETFs, which had been among the strongest performers through April, gave back some of their gains in May, partly reflecting renewed firmness of the C$. The Gold ETF (GLD) returned 5.7% ytd in CAD terms, while the iShares GSCI commodity ETF (GSG) returned 4.9%. Global Bond ETFs, contrary to consensus expectations at the beginning of the year, performed extremely well in the year-to-date through May. Bond ETFs have benefited from a combination of weaker than expected economic growth, lower than expected inflation and safe haven demand. The US long bonds (TLH) returned +8.2% in USD terms, but with the 2% depreciation of the C$, this translated into a +10.3% return in CAD terms. USD-denominated Emerging Market bonds (EMB) returned +10.7%. The Canada Long Bond ETF (XLB) posted a gain of +7.3%. Non-US global government bonds (BWX) posted a return of +6.2% in CAD terms. Emerging Market local currency bonds (EMLC) suffered from the same problems as EM equities earlier in the year, but still returned 6.5% in CAD terms. Inflation-linked bonds (ILBs) have rebounded the first five months of 2014 after a disastrous performance in 2013. The Canadian real return bond ETF (XRB) fared best, benefiting from its long duration, returning 9.2% ytd. Non-US ILBs (WIP), returned +8.1% in CAD terms, while US TIPs (TIP) returned +7.5%. In corporate bond space, the US investment grade bond ETF (LQD) returned 8.0% ytd in CAD terms, while the US high yield bond ETF (HYG) posted a return of 6.3% as high yield spreads widened. The Canadian corporate bond ETF (XCB) returned +3.5%. In May, the Canadian ETF portfolios tracked in this blog posted decent gains, adding to positive year-to-date returns. The traditional Canadian 60% Equity/40% Bond ETF Portfolio gained 91 basis points in April to be up 5.9% ytd. A less volatile portfolio for cautious investors, comprised of 45% global equities, 25% government and corporate bonds and 30% cash, gained 66 bps in May to be up 4.9% ytd. Risk balanced portfolios also posted good gains in April. A Levered Global Risk Balanced (RB) Portfolio, which uses leverage to balance the expected risk contribution from the Global Market ETFs, gained 106 bps in May, boosting to its year-to-date gain to 10.7%. An Unlevered Global Risk Balanced (RB) Portfolio, which has less exposure to government bonds, ILBs and commodities but more exposure to corporate credit and emerging market bonds, returned 70 bps in April to be up 6.8% ytd. After sharp sell-offs in US small cap and technology stocks in April, global equity markets steadied and recovered in May. While 1Q14 US and global growth were very disappointing, markets have maintained confidence that that the 1Q stumble reflected bad weather and other anomalies and that growth will bounce back over the remainder of the year. What has puzzled investors is the sustained strength of global bond markets, even as equities have regained some momentum. In May, mixed economic data combined with signals from ECB President Draghi that it was prepared to take more measures to ease monetary policy further, supported Developed Market bonds. Reassurances from Fed Chairman Yellen that the Fed would not consider raising the Fed funds rate until economic slack has subsided substantially further, also helped, especially in Emerging Markets. Ukraine remains a source of geopolitical risk, but Putin’s apparent willingness to negotiate with the new government has tempered concerns for now. Any sign that such negotiations will not lead to de-escalation of tensions in East Ukraine has the potential to upset markets in June. The Bank of Canada, with its policy rate decision on June 4 will likely reconfirm that the direction of the next rate move will depend on growth and inflation developments. Inflation ticked up in April, but 1Q14 growth, at 1.2% was well below expectations. Downside risks on inflation may have eased slightly, but the BoC will avoid any talk of tightening. After a weak 1Q14, US and global growth need to show signs soon that the stronger growth built into equity prices is emerging. If the global economy fails to reaccelerate, the May rebound in equity markets could quickly reverse. If the strong reacceleration emerges, it is hard to believe that bond markets will be able to hold on to their stellar year-to-date gains. Concerns about low global inflation continue, highlighted by the expected ECB easing and indications that China is looking at new monetary tools to ease policy without reflating the housing bubble. Emerging markets ETFs steadied in May, but continue to lag returns on comparable DM ETFs. Russia-Ukraine tensions appear to have eased. India’s election has sparked optimism about structural reforms. The World Cup will focus attention on Brazil in June. The question for active investors is whether the all-clear sign should now be waved for EM ETFs? Last month, I concluded that the with setback to momentum stocks in April, “the risk now is that stronger economic growth reverses the bond market rally and, at the same time, equity multiples reverse. Having ample cash in the portfolio was a prudent strategy in April and remains so in May”. As it turned out, major equity and bond markets rallied further in May as global uncertainties eased and global economic data was mixed. Holding cash was a drag on returns in May. Evidence of a pickup in global growth is still badly needed. US corporate earnings growth slowed in Q1, so the gains in the S&P in May pushed equities further into overvalued territory. The twin risks remain: either stronger economic growth reverses the bond market rally or further disappointment on growth reverses the equity rally. 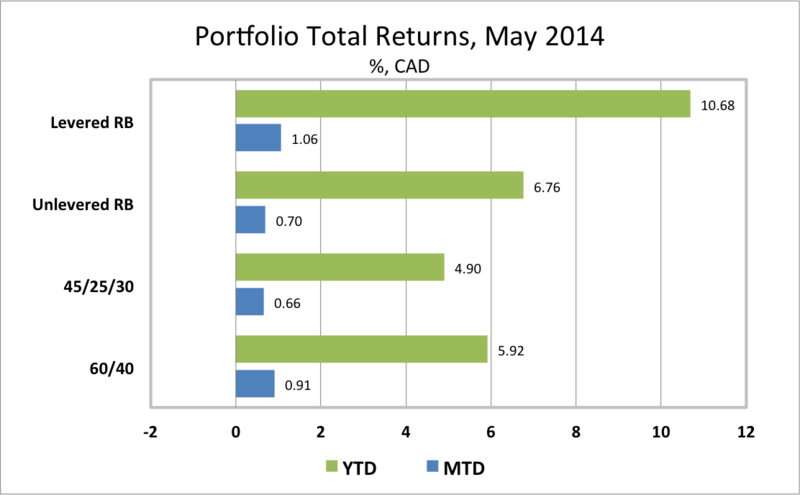 Having ample cash in the portfolio was a prudent strategy in May and remains so in June.